Hari ni terasa macam nak tengok Blue Tiger. Lama dah tak nampak Blue Tiger. Sejak berbulan lepas aku dah jarang pegi tempat dia selalu melintas. Bombardier Blue Tiger. Gagah betul namanya. Blue Tiger tu sempena lambang Harimau Biru di dinding kiri dan kanan dia. Selalunya aku akan lepak di stesen Ipoh semata untuk melihat gergasi biru kelabu ni melintas. Bunyi enjin turbo dia yang bergegar, bunyi compressor yang mengagumkan, bau diesel yang enak mencucuk hidung, bunyi hon yang mengejutkan, banyak lagi-lah! Bila dia masuk ke stesen, bergegar rasanya. Tapi itu-lah. Sibuk. Sekarang ini pun badan tak sihat sangat. Nak bergerak susah. 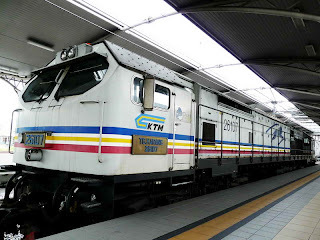 Jadi untuk melepaskan rindu, aku main-lah permainan simulator keretapi yang mana kita boleh pilih nak bawa lokomotif apa dan nak tarik kereta apa; passenger ke freight ke atau running solo je ke, boleh pilih. Aku kena run dekat 60 batu punya mainline. Sebab game ni adalah real-time maka kena agak-agak la berapa lama nak habiskan perjalanan 60 batu tu pada kelajuan yang berbeda-beda. Kadang naik bukit, kadang turun bukit. Nak slow sangat tak boleh, nak melesit karang tergelincir. Brek nak kena tengok, speed limit nak kena jaga. Jangan pula sampai terlepas stesen. Lagi dalam 5 batu nak sampai stesen, pundi kencing aku merengek mintak perhatian. Maka tanpa pause game aku terus ke tandas dan lepaskan hajat. This is a story about platform number one. Train is always fascinating. The way it moves; the way it cuts through the wind on its track and rattles the ground all over, it is beautiful. I am always grateful that i have met someone whom i placed dearly in my heart then and still, who happens to love trains as much as i do. She was always passionate about them locomotives and coaches, and it was always fun to go for a visit to the recently refurbished Ipoh Railway Station late at night to catch the passing trains; freights, cements, and as well two passenger trains moving back and forth. train that came by. We waved to the passing train, hoping that love will remain tough and strong just like the locomotives are; pulling heavy burdens along the way without a hassle at all. What memories platform number one could give us that time. And that was the place where I actually proposed to her. Right next to the incoming Express Langkawi, I said an oath of thousand promises. I let out my words of will, and i told her what i feel. Heart was pounding fast just like those dashing class 22, and blood rushed like fuel line charging every aspects of my body with adrenaline. With love. And soon after, our love was just like that bloody Express Langkawi; moving fast into the cold night, not knowing what’s waiting but never will it stops moving. Another chapter started in my life, with someone just like me; someone who loves trains. But sometimes, a train breaks down. Our love never did reach the destination. We started off with a load or two, and increasingly to countless, but we never did give up. We kept on pulling them up along the way, doing our best to keep them intact. But all out of a sudden our engine gave up. Our fuel ran out. Or brake gave in, and our loads began to lean away from the track. Arguments after arguments, forgiveness aside. We all did wrong all the way, but we did forgive every and each of them but the last one. The one that jammed the whole freight - the one that halted us to this line in the middle of nowhere. I have cried, and i have suffered. It is so hard to move on this wrong way on a one way track. I cannot bring this runaway train alone by myself. Can’t do it, I just can’t do it alone. I need my co-driver back. Every now and then, every time i step into platform number one, it seems that this broken heart keeps on getting apart. Alone now, but i never stop walking alone the cold track, remembering how life was so beautiful when she was there right beside me. Everything there is still at their places just like when we left them the last time; the wooden benches, the gravels, the old garbage bins. The Indian man who opens a shop there was still there looking blindly into the misty night. But always, there is something missing. Something which is not right. Something very wrong that it hurts me deep inside. for any incoming train but the station was nothing but empty. Just like how my heart is. Time passed by so slowly. I wasted the whole night waiting on that cold bench. I did not want to even think about it, about her, about everything. When I was about to get myself back, it was already dawn. The station was still clear. There was no human. There was no train. Nothing. The silence broke my emotion. I walked away from that bench to where we first arrived in this station, hoping for one crazy thing which no man can make possible. I walked to the metal bars, expecting to see her smiling at me with her arms wrapping around her body like the last time. When i got nearer to the bars, i closed my eyes and opened them again after a few seconds. But she was never there. Editor's note: This story was written by me in December 2008. It reflects my feelings over my past relationship that failed. It is history now, and it means nothing to me but a beautiful story of my bitter past. I am with a new person now, the one who is now under my training to be my fireman; the one who checks on the train should something beyond the main driver's attention occurs. The one who will, hopefully, help me move this train again towards a meaningful destination. Please do comment. Thank you. aku cuma bercinta dengan angan-angan sendiri. lawak aa citer pasal main MSTS ngan teren tergolek bila pi kincing! Akakakss!